Additional Material: 8 pages of “behind the scenes” images and commentary from Kevin featuring his layouts alongside Simon’s finished pages. 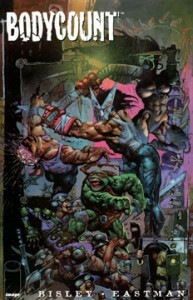 Casey Jones and Raphael find themselves assisting an assassin on the run from her former employer, who has sent men to kill her. Extremely violent and intended for adults.